Earlier this year I reviewed Boulevard's Smokestack series with mixed results, but then I read on Beernews.org that they will be released in 12 oz. bottles next! 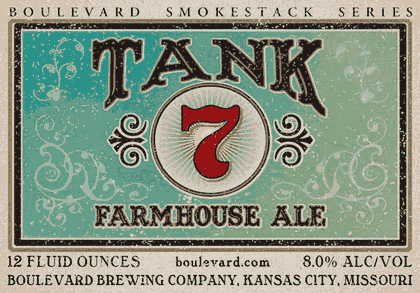 This is exciting, because I see amongst their labels is one for "Tank 7", a farmhouse ale of some sort. Though I didn't review Boulevard's other saison in the original post, I did get a chance to try it a few weeks later, and they have promise. I'm looking forward to seeing what they can do with this new farmhouse ale. Also, I'm hoping that somebody back home will manage to save me a bottle. This page contains a single entry by Erik Arneson published on September 14, 2010 7:07 AM. Travel Skills: Basic Bicycle Maintenance was the previous entry in this blog. The Oenophile's Quandary: Economy vs. Psychology is the next entry in this blog.